Map 1B follows Map 1A when you are working with a current patient or a new patient with an alcohol issue. Begin at Point R at the top of the flow chart. The first issue is whether this patient is currently misusing alcohol [Section 3], and if so, in what way. If not, return to Map 1A at point S, to consider other possibilities. Assess the dangers that the person’s drinking poses [Section 6]. Go through some preliminary issues [Section 47]. Then consider having a medical work-up [Section 30]. These issues are considered in Section 4 and Section 5. If he/she is physiologically dependent, then you need to consider detoxification as a medical treatment to stop the dependence. This issue is considered on Map 2. 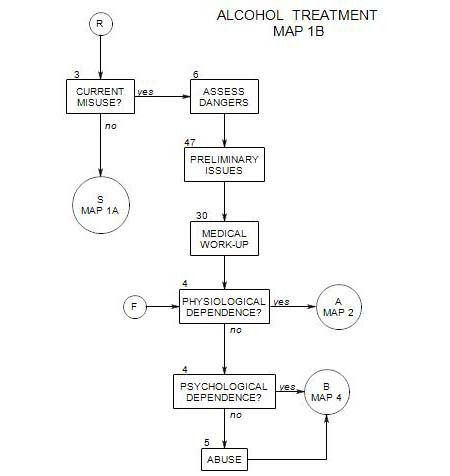 If the patient is either psychologically dependent on alcohol or abusing it, go on to Map 4 for issues of rehabilitation.